The Asis Family stands outside of the church at Casa Hogar. Matias (far left), Josimar (Red Tie), Andrea (Daughter of Roberto and Paola), Sebastian (Son of Roberto and Paola in blue striped sweater), Juan Carlos (back row, can only see his head), Hans (white shirt, black tie, necklace), Henry (green shirt, black tie), Paola (Mom), Roberto (Dad), Eider (white shirt, black tie, grabbing his sleeve), Jairo (Orange shirt), Samael (Yellow Shirt). 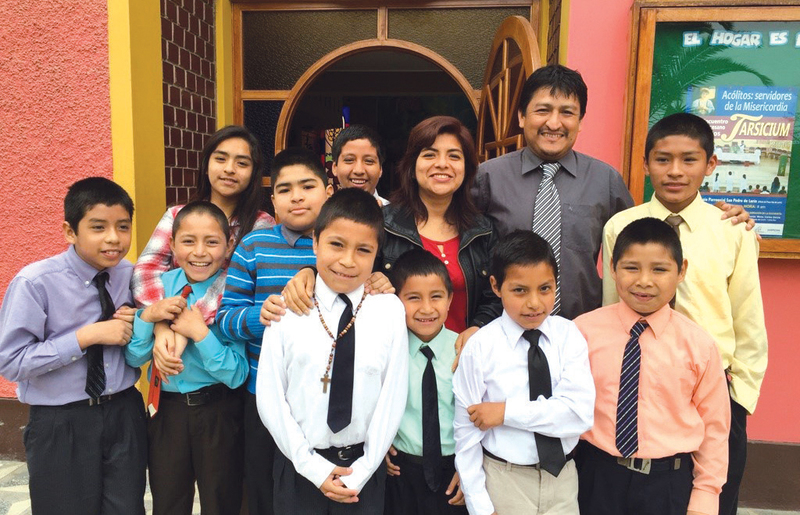 Fifteen years ago, when Roberto Belleza and Paola Junchaya were just newlyweds, they heard about a job opening at an orphanage outside of Lima, Peru where they could work as family teachers. Paola had recently been told that she would never be able to have children, so the idea of working with young kids at an orphanage seemed like a perfect match. After going through the interview and training process, they were hired. As they were getting ready to move into Casa Hogar Juan Pablo II, they were told that they instead would be moving 10 hours away to another orphanage in Oxapampa, which was a very remote community in the jungle of Peru. Roberto remembers the first time he met Fr. 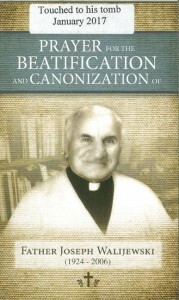 Joe and how there was this unexplainable peace that came over him. Paola remembers how he would always remind them to have patience and how even on her bad days he could give her the strength and the wisdom to get through the hardship. Paola and Roberto were so happy when Andrea was born but when the baby was only one month old she found out she was pregnant again, with their son Sebastian . Paola is sure Fr. Joe is a saint because she knows it was through his prayers that she was able to have two biological kids, and during that time where she was told she really couldn’t have kids, he gave her the opportunity to be with the children at the orphanage. Roberto said the peace he felt when he was in Fr. Joe’s presence could only be from someone holy. 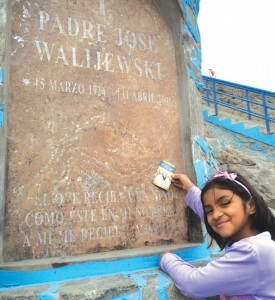 Although Father Joe has been gone for over 10 years now, the memories of his kindness, patience, good humor and love are still remembered by many of the locals in Lurin, Peru, and the results of his intercession are still visible. Fr. Joe wanted nothing more than to bring joy to any life he could touch, and Paola Junchaya knows first-hand how trusting in Fr. Joe can bring a lifetime of joy.